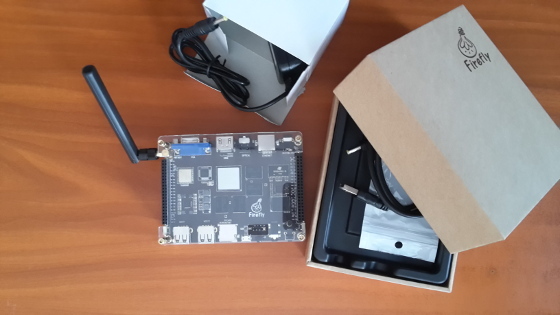 Recently I received the Firefly-RK3288 development board with Rockchip Quad-core Cortex-A17 ARM SoC with Mali GPU. The board has 2GB dual-channel DDR3 RAM and 16GB internal memory. Firefly-RK3288 has both HDMI and VGA ports, 2 USB hosts, an Ethernet port, infrared, Bluetooth 4.0 and a WiFi. This is a high-performance hardware platform suitable for variety of Internet of things, multimedia applications and home automation tasks. There are images for Android and Ubuntu. Out of the box Firefly-RK3288 boots Android KitKat version 4.4.2 with Linux kernel 3.10. Firefly is a very durable device and has the fame of a board that is almost impossible to brick. You can buy Firefly-RK3288 from aliexpress for just 129 USD, excluding shipping and import taxes which depend on your location. The board that you see at the video was delivered very quickly with DHL and it was very carefully packaged. Firefly-RK3288 comes with a nice case which can be easily assembled with bare hands. As a software engineer I am pleasantly surprised by the design of the case. There is a convenient hole which allow you to plug a cable to the UART of the board and to do serial debugging.